George to Cape Town flight bookings qualify to participate in the exclusive SouthAfrica.TO travel vouchers for reviews rewards program. Email us to let us know how your last flight went and we'll send you travel vouchers. Simple. SA Express and SA Airlink used to be in a cosy relationship, where neither flew on the other's routes. This has changed, and where previously SA Airlink had a monopoly on the George to Cape Town flight route, consumers now have the luxury of choosing between the 2 airlines. It has also helped bring airfares down on the route. Expect smaller planes, and perhaps even turboprops. Taller passengers have to bend their heads to get into the seats on and seats are relatively narrow. SA Airlink GRJ-CPT flights are in Embraer ERJ 135 jets, which seat 3 crew and 37 passenger (ie there'll be 2 pilots and a flight attendant looking after you), or in Avro RJ85 jets which seat 95 pax, 2 pilots and 2 cabin crew. SA Express George to CT flights are in Bombardier CRJ200 jets, which have 44 passenger seats (2 each side of the aisle), 2 for pilots and usually 1 cabin crew member (optionally 2). To get on the cheapest flight from George to Cape Town, use the airline price comparison tool on the left to check prices - try be flexible with your schedule to secure the cheapest airfare. As the crow flies it is only 349km from George to Cape Town, so it's entirely possible to drive the route, and this is what most people do. 2 Jun 2014. 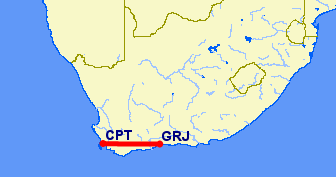 SA Airlink adds an additional flight between GRJ & CPT, on weekdays. 1 Nov 2013. SA Express flights to Cape Town from George are relaunched, with 2 flights a day from Mondays to Fridays, leaving George at 07h50 and 14h30. 2 Sep 2012. South African Express commenced 4 weekly CPT - George flights, but quit flying the route after just one flight, with the reason given that there were lower than anticipated booking numbers (or perhaps because they weren't ready to take on SA Airlink). There are only SA Express and Airlink flights from George to Cape Town. Most people choose to drive from George to Cape Town, rather than fly. It's 412km from Europcar at George Airport to Europcar at Cape Town International Airport, travelling along the N2 National Road. Along the way you'll pass Groot Brakrivier, Mossel Bay, Riversdale, Heidelberg, Swellendam, Caledon, Grabouw and Somerset West. Intercape bus. The Intercape bus operates a traditional bus service across a vast network of South Africa and some of its neighbouring countries. Baz bus. Baz Bus operates a hop-on hop-off bus tour across South Africa, and is especially popular amongst backpackers, stopping off at 180 youth hostels along its route. On your way from George to Cape Town you can stop off at Mossel Bay (see accommodation Mossel Bay for a place to stay) and Swellendam. "We took the Garden route from George to Cape Town. As expected, Anand was in his formula one driver suit on the highway...As the sun came up, we were on a road stretch with large mustard fields, plants blooming with bright yellow flowers. It was looking like someone had placed a green and yellow bed sheet with dark brown dots at road side." We usually use EZ Shuttle, but there are a number of companies offering a Cape Town shuttle service.